Apple has backed down from its requirement that content and subscription providers who offer their wares through the Jobsian App Store must charge the same or less for that content when it's offered from a provider's own website. Cupertino has also axed their requirement that content providers must offer the same content and subscriptions in their iOS apps as they do from their own services. ... if a publisher chooses to sell a digital subscription separately outside of the app, that same subscription offer must be made available, at the same price or less, to customers who wish to subscribe from within the app. In addition, publishers may no longer provide links in their apps (to a web site, for example) which allow the customer to purchase content or subscriptions outside of the app. When a content provider sells the same subscription from its own website, of course, they keep all the cash and maintain a direct relationship with the subscriber. Despite the changes in their who-sells-what-where stricutures, Jobs & Co. will still take a hefty 30 per cent cut of subscriptions sold through iOS in-app purchases, and will keep the subscriber's optionally supplied demographic info to themselves. Apple's subscription policies caused a firestorm of objections among content and subscription providers when they were announced. 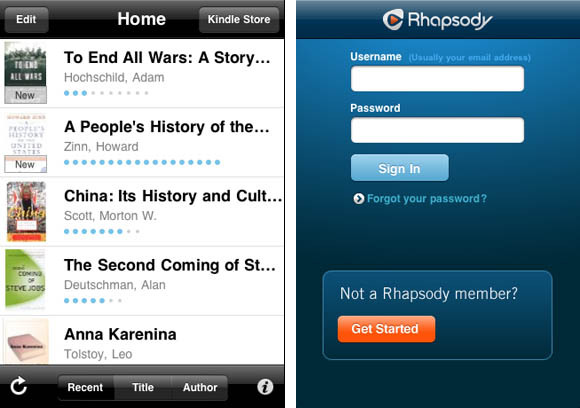 Rhapsody, for example, issued a statement saying that they would "not be able to offer our service through the iTunes store if subjected to Apple's 30 per cent monthly fee," and Last.fm's cofounder Richard Jones sent an IRC chat saying "apple just fucked over online music subs for the iphone." Rhapsody and Last.fm will now be able to sell subscriptions to their music services on their own websites at any price they choose, as long as they don't link to those services from their iOS apps. Amazon's Kindle app currently includes a link to the Kindle Store – and according to Apple's subscription guidelines as they now stand, it has until June 30 to remove it. Having Amazon offer its millions of titles through the App Store would have been a logistical nightmare, but now they won't have to make all those titles available through Apple's in-app sales as well as through their own website – not to mention giving Apple a 30 per cent cut of all in-app ebook sales. Apple's guidelines-relaxing move appears to have been made in tandem with the announcement of its iOS 5 Newsstand feature, revealed on Monday, in which magazines and newspapers will be gathered together in one place in the App Store, pushed to iOS devices in the background, and gathered together in one Newsstand iOS app. Apple, as is their wont, is keeping tight-lipped about the reasoning behind its relaxed guidelines. One commentor to the MacRumors story, however, provideds an interesting bit of insight: "From jobs I've been offered," writes kdarling, "publishers are planning a major move into Android. Without outside pressure, Apple would keep iOS as tightly controlled as possible." Another bit of recent pressure on Apple: the Financial Times has just launched a browser-based service that bypasses the App Store entirely, relying instead on HTML5 and the good ol' web. "We're encouraging our readers to switch immediately to the new FT web app," the paper says, suggesting that readers junk their current FT iPhone and iPad apps. In its Technical Q&A about the web app, the FT says one reason for the switch to the web is that "There is no extended release process through an app store and users are always on the latest version," and also that "developing multiple 'native' apps for various products is logistically and financially unmanageable."